As I write this it is -14 degrees in Toronto and hard to believe that the new MLS season will start in less than a week. As a follower of the league since it begin in 1996, and a person who follows all professional sports with interest, there is always an excitement to the season opener and a thirst for knowledge in preparation for the upcoming year. Although to be honest, it’s a lot more difficult for an MLS fan than someone who follows another sport or league. There is always a vagueness when the MLS season starts: most rosters continue to be filled, a fair amount of new players, and people have a difficult time knowing the impact of their own clubs' new signings oppose to the other teams in the league. This means even predictions of well-respected pundits tend to be those of game 35 of the previous season with the previous MLS Cup winners as favorites and those who missed out on the playoffs expected to miss again. This is despite most clubs changing 1/3 to ¼ of their rosters during the off-season. I can accept the reasons for this as information is sparse, the league likes to keep their secrets, and MLS doesn't have the resources or media interest of other North American sports. This means few, if any, preview magazines, and no great debates on tv, radio or in newspapers. While the league does a decent job showing preseason games online, it tends to be a blur and even clubs themselves use the preseason like an NBA Summer League as they try out rookies and trialists to see who is going to fit the last roster spot oppose to giving you a sense how the team will play the first week of the season. Much of what I do is finding uncertainties and lack of awareness, which I find presents opportunities to find answers, educate, and in some business cases take advantage. As a person who specializes in statistics and analytics in sport the simplest way to capitalize on this is sports betting and for many years of my life I worked directly in the gaming industry. The main task was creating betting lines and taking advantage of ones that I believe don’t give a fair representation of what should take place. One model I have developed for soccer is projected or expected results. The theory of this is pretty common and used in everyday sports practices, although it mainly came to light in baseball through the work of Bill James. The basic idea is an individual player’s key statistics remain fairly constant based on the player’s skills. If a player scores 20 goals one season you would expect the range the following season if the circumstances are the same. Of course in soccer circumstances are never the same, so this is where deeper analysis comparing to historical precedents and in some cases an educated guess. This tool is most useful in performance analysis for setting expectations for your team and the individual players, and then reevaluating long term team performance based on how they compared to the original expectations. I have also had some success in projecting results at over 60% and it adds new content in terms of predicting how the season should turn out and providing a useful tool in fantasy sports applications. 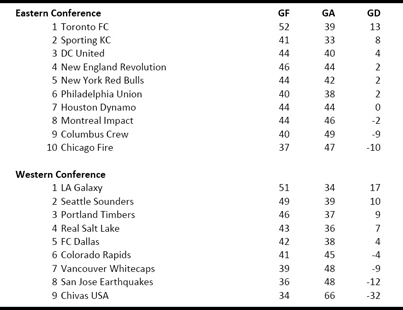 I have also had good success in MLS in terms predicting the top clubs compared to the teams who will struggle and for the last few years been spot on with how the Canadian teams performed and where they finished by seasons end. I will be writing individual preview articles for the three Canadian clubs in the upcoming week, but this is my overall prediction in terms of how the season is going to turn out. The analysis is broken down by expected goals scored for each team, expected goals allowed for each team, and teams are listed based on goal difference you can use further analysis to predict wins, draws, losses and points, although it’s a bit tricky in terms of MLS since teams don’t play a every weekend or on an even schedule. 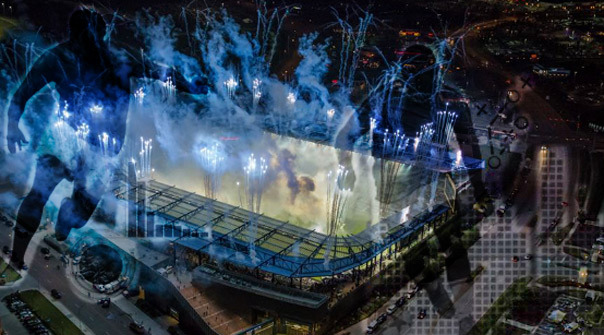 I will be posting on my twitter account this week detailed information about all MLS teams this season, including projected data for each individual player that produces the expected goals scored totals. For the goals allowed the analysis is less defined, but I did use more advance statistics breaking down potentially how each team will play including: possession, passing efficiency, errors and even used some analysis popular in hockey such as +/- and CORSI to create what I hope is a better analysis. Toronto FC's high rating is of course based on the expectations of their new signings and my overall analysis sees Jermain Defoe as the leading scorer in MLS this season as well as Gilberto being one of twenty players projected to score double-digits in goals this season. There are some concerns regarding the other two Canadian teams, as well as Canadian coached Chicago (Frank Yallop) and San Jose (Mark Watson), based on the quality of players they have in their team compared to the rest of the league. While Chivas USA is still a complete mess both on and off the pitch. In terms of fantasy I imagine most people will be playing the MLSSoccer offering so I looked into projected fantasy points for each player this upcoming season and the value based on the price provided by the game. For me, players who standout as best value for price include: DC United keeper Bill Hamid, Defenders Steve Caldwell (Toronto), and Hassoun Camara (Montreal), Midfielders Diego Fegundez (NE) and Stefan Ishizaki (LA) and Forwards Will Bruin (Houston) and Gabriel Torres (Colorado). Personally, I’m disappointed by the MLS Soccer Fantasy game. After writing about issues last year and seeing nothing has really changed, the league still chooses to use the same engine as the Premier League despite findings that the EPL game only had a 30% retention after a few months, where comparative sports such as Baseball, Football and Hockey is close to 75%. I must admit I lost interest in last year's MLS game by midseason despite having a full league of RNO contributors and readers. MLS will have to do a serious overhaul if they want this potential useful marketing tool to be worthwhile. That being said, it is one tool that allows followers of the league to get reintroduced, or in many cases find out about new players in the league. Another tool of course is my fellow contributors to Rednationonline who go through great effort providing us with our football fix year round and hopefully my recent contribution will add to this and get people excited despite the weather being more conducive to hockey than soccer.